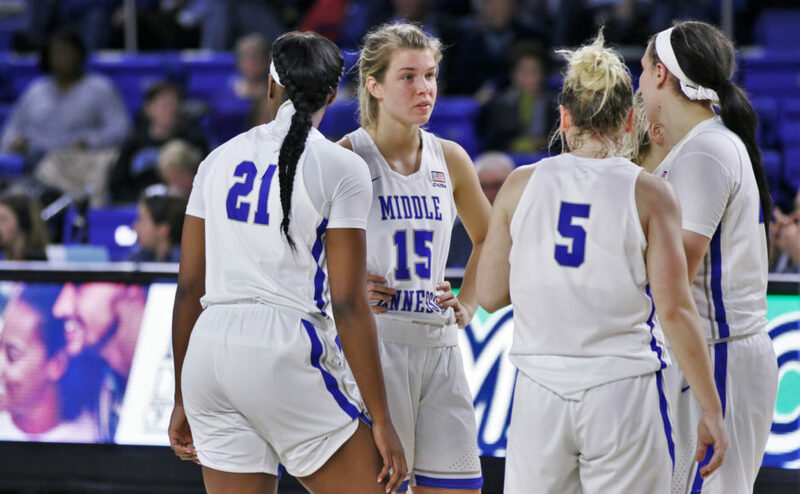 The Middle Tennessee Lady Raiders (13-9, 5-4) battled neck-and-neck with Louisiana Tech (14-8, 5-4) on Thursday night, but the fourth quarter proved to be their downfall. 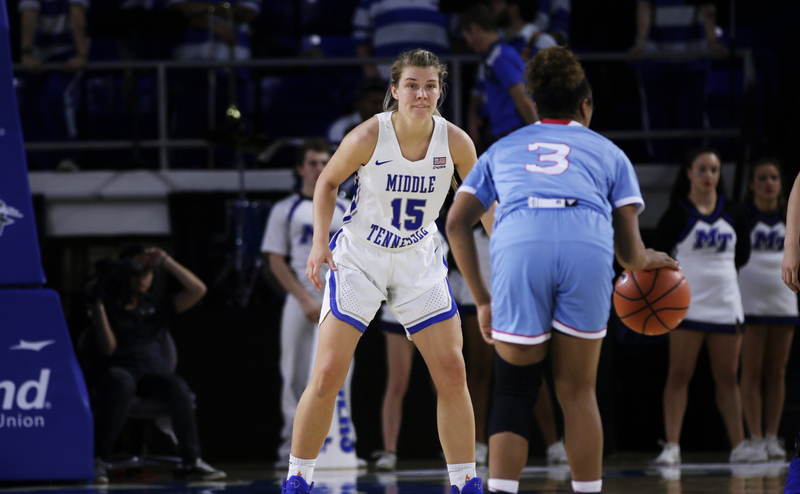 The Lady Techsters embarked on a game-changing 14-2 run to start the quarter and buried MTSU by a final score of 66-49. The first quarter was slow-developing as neither team could establish a preferable pace of play. Both teams combined for nine turnovers in the first quarter alone, and neither team shot above 36 percent from the field. The Lady Raiders led 10-6 at the end of the quarter despite the offensive futilities. They benefited from a five-point outburst from senior forward Rebecca Reuter to give them an edge. The second quarter witnessed similar offensive struggles from both teams. 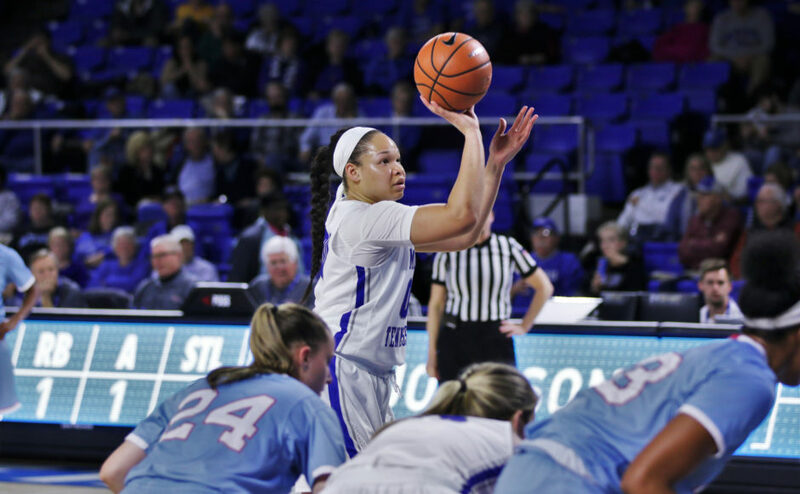 The two squads combined for nine more turnovers in the second period, but the difference was Louisiana Tech’s three-point shooting. 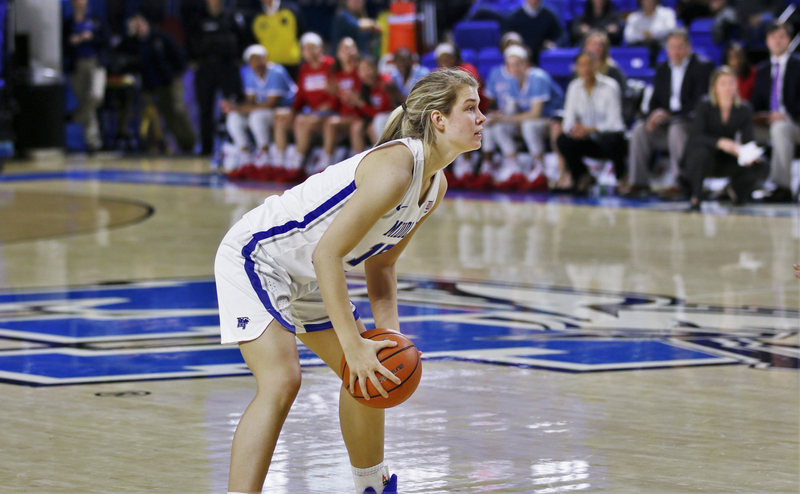 Junior guard Taylor Stahly lifted the Lady Techsters with two three-pointers en route to a 16-8 scoring run. This gave LA Tech a 22-18 lead going into halftime. 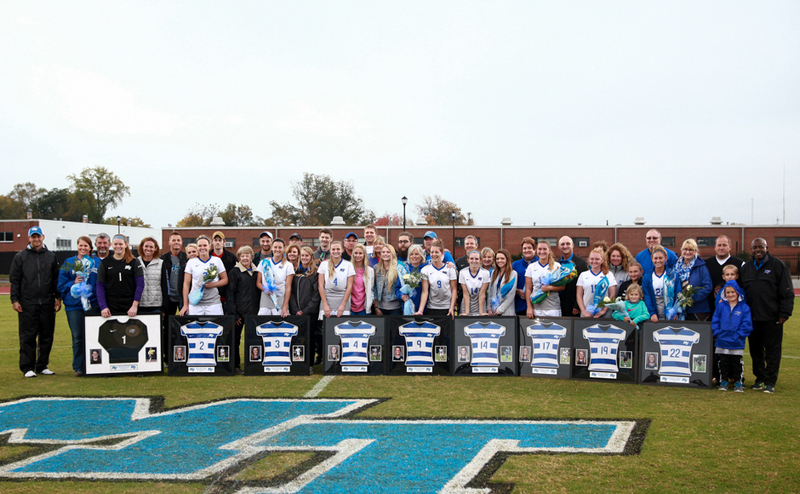 In the second half, the Techsters began to take total control of the game. 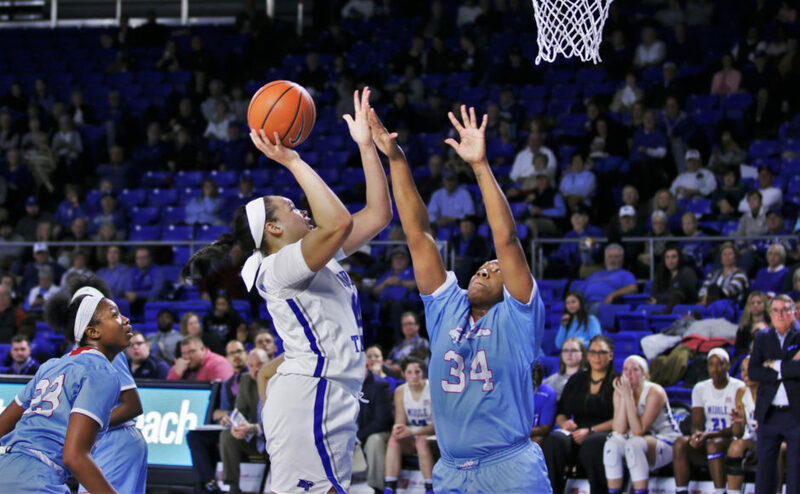 With 2:16 remaining in the third quarter, junior forward Zhanae Whitney connected on an easy lay-up to give LA Tech a 34-25 lead. The Lady Raiders responded with a furious scoring run of their own to end the quarter. 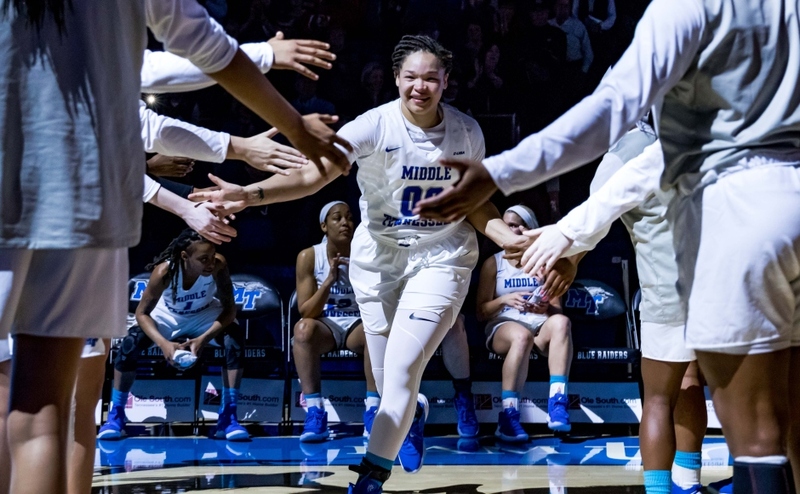 Sparked by an Abbey Sissom bucket, MT went on an 8-2 scoring run that was capped off by an Alex Johnson jumper at the buzzer that sent the crowd into a frenzy and gave her team new life. The deficit was cut down to a mere two points going into the final decisive frame. In the fourth quarter, however, the wheels fell off and MT lost control of the game. LA Tech started the final quarter on a 14-2 scoring run in only three-and-a-half minutes, led by junior guard Kierra Anthony. 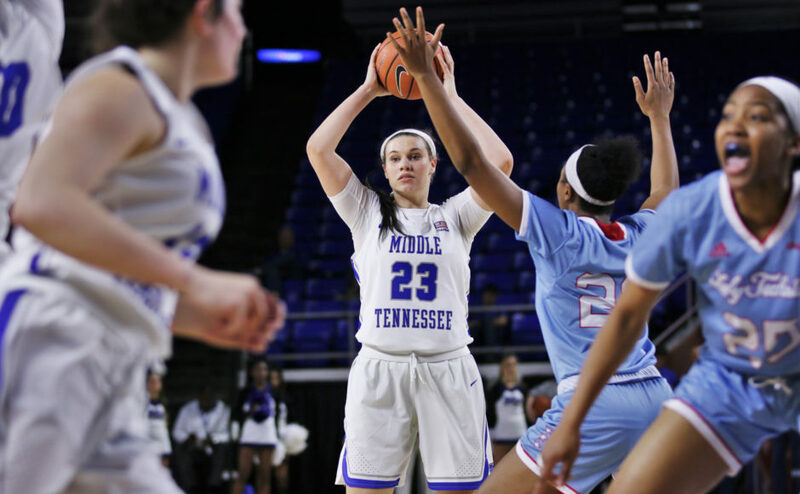 She used a dynamic fourth quarter to give her a game-high 20 points, and the Lady Techsters built an insurmountable lead that MT would not overcome for the rest of the contest. 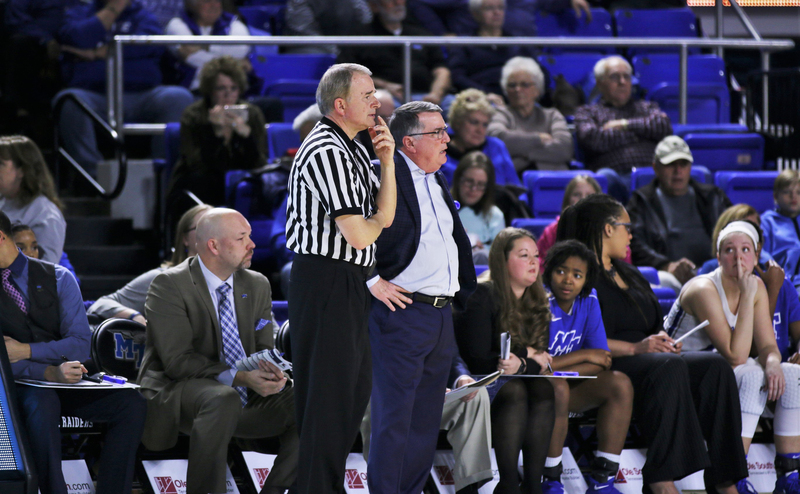 LA Tech outscored the Lady Raiders 30-15 in the fourth quarter and sealed the game from the free throw line. 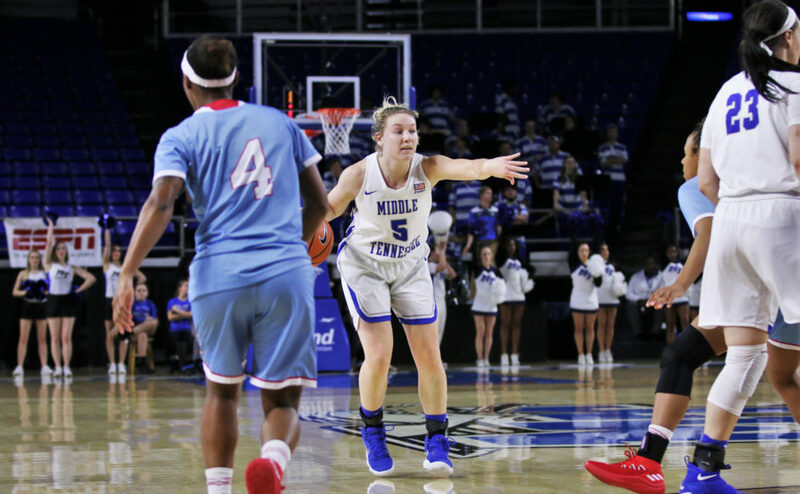 The Lady Techsters made 17-21 free throws in the period alone to put the game out of reach, as they left Murphy Center with a 66-49 win. Ball security was certainly an issue for MT as they committed 20 turnovers throughout the game while only generating eight assists. 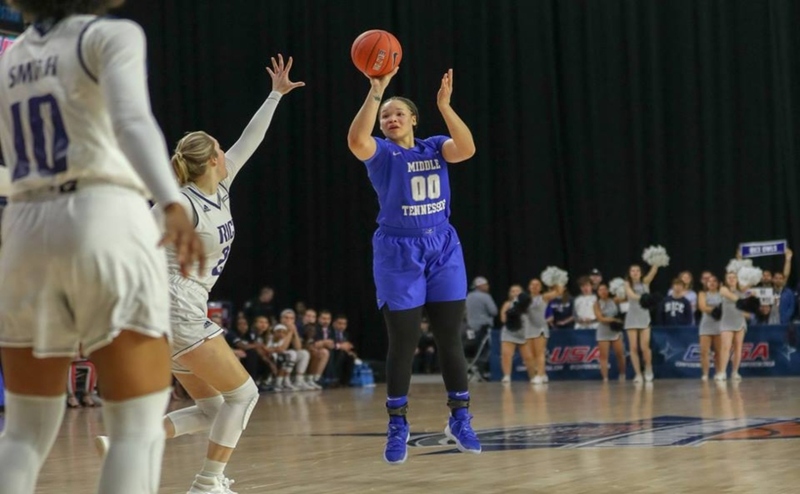 Individually, Johnson was the primary culprit as she committed six turnovers on her on. Behind her, Anna Jones and Gabby Lyon turned it over three times each. The man in charge was not happy at all with his team’s performance, and he knows that they will struggle to win any games if they continue to play like this. After the first three quarters of basketball, LA Tech combined for only 36 points. In the final quarter, they exploded for 30. 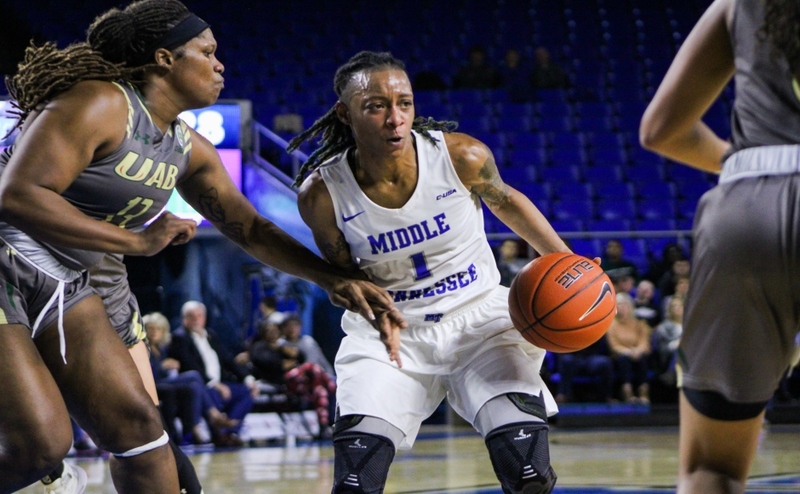 The Lady Raiders cut the deficit to two points going into the quarter, but all momentum was instantly lost as Anthony and junior forward Reauna Cleaver combined for nine points during LA Tech’s crucial 14-2 scoring run. 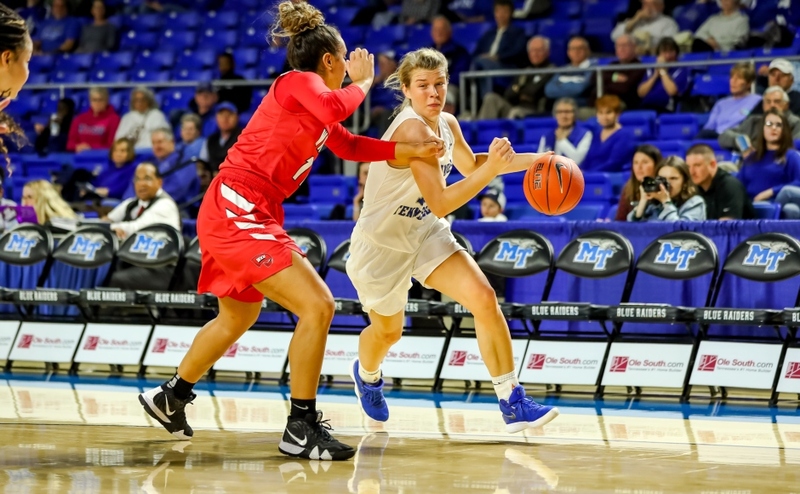 For Middle Tennessee, it appeared that the main problems were a lack of energy and bad communication throughout the final frame. 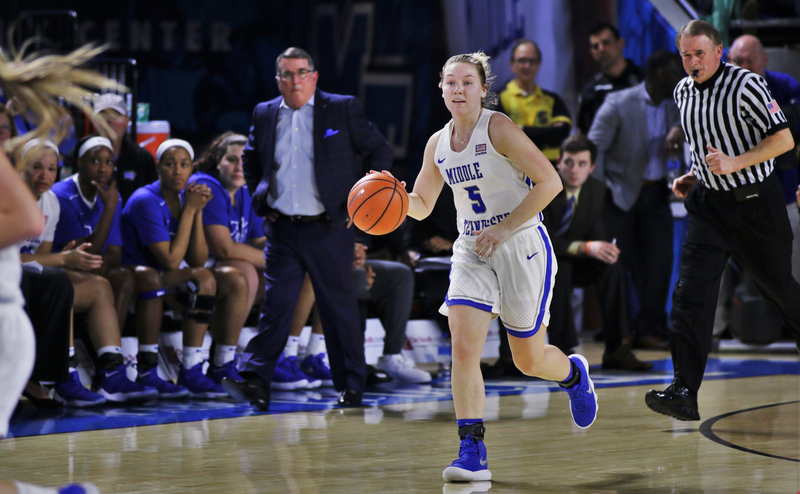 Following the loss on Thursday night, the Lady Raiders will have to wait a week until they get to return to action where they will face Florida Atlantic in Boca Raton, Florida.